Authorities in Mexico charged a truck driver with human trafficking after discovering 94 people in his vehicle headed to the United States earlier this week, according to news reports. A report from Reuters says that the 94 people packed into a truck were found near the southern city of Tuxtla Gutierrez, the capital of the state of Chiapas. Among them were 19 people from Bangladesh and Nepal, as well as Guatemala, El Salvador and Honduras. 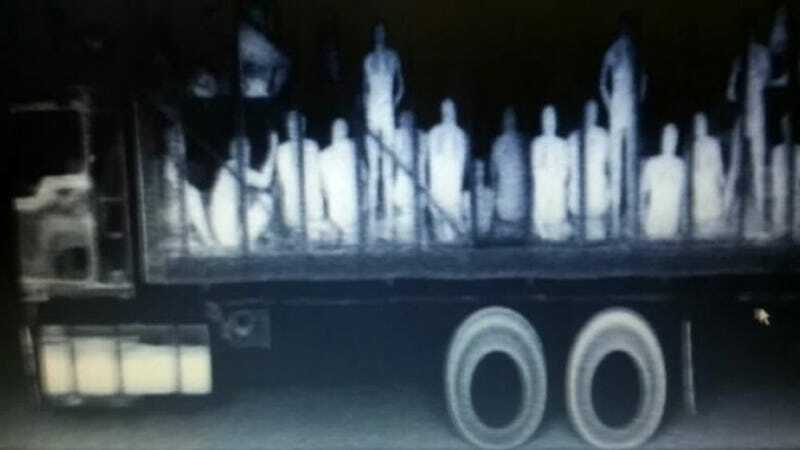 They were detected in an X-ray scan Monday night outside Tuxtla Gutierrez. Officials say the migrants were kept in inhumane conditions. (Is there a way to "humanely" cram close to 100 people into a single truck?) Several were treated for injuries, and many experienced symptoms of suffocation. The undocumented immigrants will likely face deportation hearings in Mexico, according to Reuters.